“Dad Bod” articles keep popping up all over the place, which apparently means that women are attracted to men with soft midsections. Due to the wide variety or responses these articles seem to be generating in mainstream newspapers, there is only one way to break it down so red-blooded American men everywhere can understand: I will draw from Jean Claude Van Damme’s 1988 classic, Bloodsport. First we have the Frank Dux body. In 2015, anyone can be fat. Poor people in the United States are more likely to be fat than malnourished (note: Doritos and Ding Dongs are cheaper than guacamole). The chiseled male frame obviously telegraphs strength, but it also signals discipline, consistency, control, commitment and focus. The downside is that it can also be an indicator of vanity, narcissism, obsession and a variety of other negative traits. Next we have Ray Jackson, the beer-swilling, Harley Davidson-loving tough guy who works hard and parties hard. He’s a small-time bad boy with a big heart. He’s tough. He’s manly. He’s rebellious and loyal — but he doesn’t count calories. In short, he’s a good time and a man you want around in bad situations. His negative qualities are that his carelessness and sloppiness can inadvertently get himself or others hurt. 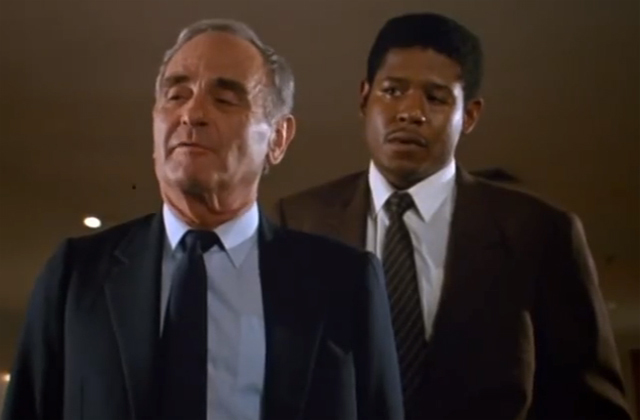 At some point we come to the bodies of by men like Norman Burton and Forest Whitaker, who play the soft-bodied government officials sent to bring home Frank. Their “dad bods” are definitely not like Ray Jackson’s, although they still probably are what writers from The Washington Post imagine when try to describe the physique to readers. Finally, we have the possibility that some women are just like Janice Kent (Leah Ayres), the reporter whose motivations are not quite what they seem. Just like the woman who wants to get close to the fighters — all so she could take down the tournament that means so much to them — some women are probably “attracted” to “dad bods” because then they become the more attractive one in any relationship. Many insecure women wouldn’t want to be in a relationship with a man sporting a Frank Dux-type body, if for no other reason than to fight off the perception that they are the less attractive mate. Beauty often brings power, and one way to wield power over a man is to be his physical superior. As you can see, dear reader, the “dad bod” debate offers armchair psychologists, sociologists, gym rats, and cultural critics hours of material. It can also be as deep or as shallow as we want it to be (feel free to go either direction in the comments section, as long as you keep it clean). In full disclosure, I must admit that I really only used the topic as an excuse to once again talk about Bloodsport, because it should be required viewing for all American boys — along with Rambo: First Blood Part II, Rocky IV, Predator, Terminator 2, and The Dark Knight. If you have read this far, then congratulations: You likely grew up in the 1980s and are a healthy American male specimen who still has testosterone pumping through his veins (or a really cool woman). I salute you. No matter what body type you have, I think the key to attracting a good woman is to exude manliness. For further reading, I suggest heading on over to (surprise): The Art of Manliness. See you at next year’s kumite. Loved Bloodsport, they don’t make movies like that anymore! I always loved Ray Jackson as a character. When I was a kid I almost wanted them to make a sequel just to see him make amends for letting pride screw up his fight. 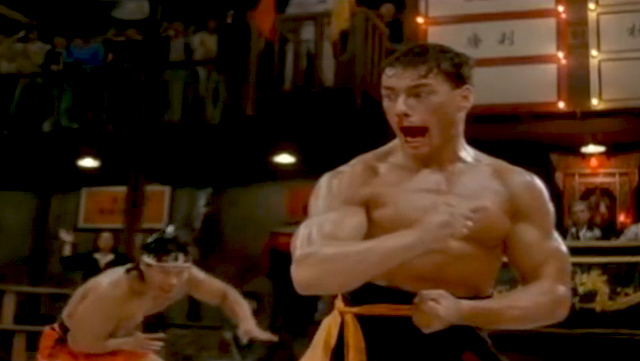 I often wonder how many times I’ve seen Bloodsport. It has to be dozens, if you count just having it on in the background as I’m working on some other side project on the weekend. It used to come on WGN quite frequently, late at night, when I was younger. Or even a movie about younger Jackson; must have gotten into some good roadhouse rumbles to get attention and a kumite invite. I bought Bloodsport in video cassette box set with Cyborg and Death Warrant in 1995. Bloodsport was by far my favourite of the three and i soon wore through the tape. I own it on dvd but can’t stop myself watching it whenever it is on tv, even if i catch it part way through. Just decided to search my TV package and Bloodsport is available on demand for free. Guess what I’m watching later? Nice! When I lived in Germany I remember actually finding the Bloodsport soundtrack in some random music store. Those were the days before Amazon, etc. Heck, I had to go to the library just to use the Internet — for 15-minutes at a time. I bought a copy for me and a copy for one of my brothers. That was a fun day. I hope you enjoyed last night’s Bloodsport viewing. I genuinely miss looking round record shops. Once a month a used to go to a cd/record fair that moved around the local towns. Found so many rarities and bargains there. I only just watched Bloodsport as on Wednesday I went to see Mad Mad and Mad Max 2 at the cinema in a double bill and yesterday went out with the inlaws. Is there anyone that has not seen Bloodsport? I remember the ladies drooling over Frank while watching that movie. Weren’t Van Damme and Ogre (another 80s classic film reference) supposed to be brothers in this film? Haha. Nope. Van Damme’s character initially saw him on a bus. Jackson was hitting on some lady who was having none of it. Later on in the film the two meet and play “Karate Champ” on an arcade game together. But didn’t VD’s bro in the film get his back broken by the immense (Asian) champion early on? And he looked nothing like VD (black hair, mustache)? I think I’m getting confused. 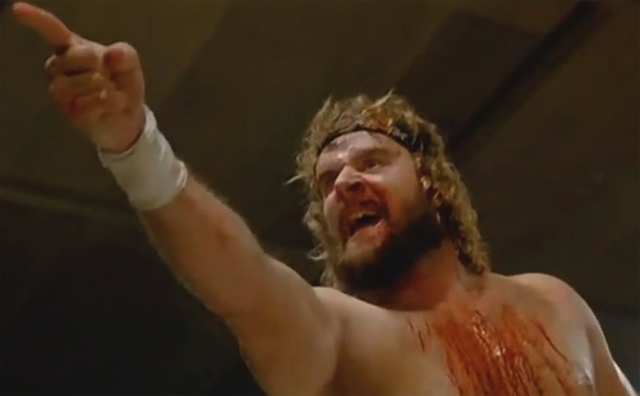 Donald Gibb, who played Ray Jackson in Bloodsport, also played “Ogre” in the Revenge of the Nerds movies. I thought that’s what you were talking about. If there was another fighter who broke his back in the film who was supposed to be Frank Dux’s brother in the movie, then I missed any reference to that. 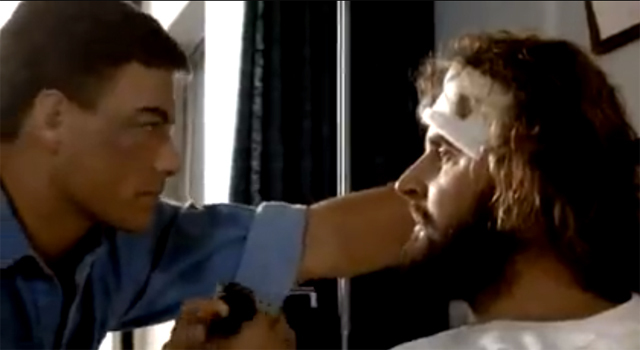 When Ray Jackson has his head smashed in by Chong Li (Bolo Yeung), nearly dies and goes to the hospital, Frank takes off his headband and keeps it with him throughout the rest of the kumite. He avenges Ray’s near-death, but at no time does he ever mention Ray is his brother. I think perhaps at the end of the movie he says something to indicate they’re “brothers” in the sense that the experience forged that sort of relationship between the two of them, but that’s it. I never watched any of the other Bloodsport movies that followed, so I’m not sure where the story went after the original.